INTRODUCTION: Single port laparoscopic surgery is a promising new technique, but may be associated with unique psychomotor challenges, including use of articulated and/or deliberately crossed instruments. Using single port surgical simulation, we defined performance differences between surgeons with and without single port clinical experience, signifying the need for specialized training as a prerequisite for clinical single port surgery. METHODS: Study participants were assigned to three groups: Residents (RES; PGY 2-3; n=11), experienced laparoscopic surgeons (LAP; > 100 advanced cases; n=6), and surgeons with prior clinical single port laparoscopic experience (SP; range 2-25 cases; n=4). All subjects performed the FLS Precision Cutting task on the ProMIS™ computer-enhanced laparoscopic trainer (Haptica Ltd., Dublin, Ireland). Roticulating EndoGrasp™ and Roticulating EndoShears™ instruments (Covidien, Inc., Mansfield, MA) were used either in 1) straight configuration via conventional laparoscopic ports, or 2) a starting crossed instrument configuration with grasper maximally articulated, placed via a SILS™ Port (Covidien, Inc). All subjects viewed the FLS task tutorial prior to task start. Two iterations of each method were performed. Starting method was alternated for successive subjects. Simulator measurements included time (sec), path length (mm), and smoothness (number of recorded velocity changes); accuracy (mm away from target, non-target material area) was recorded manually. Comparisons between subject groups were by ANOVA and between methods by Wilcoxon rank sum test. 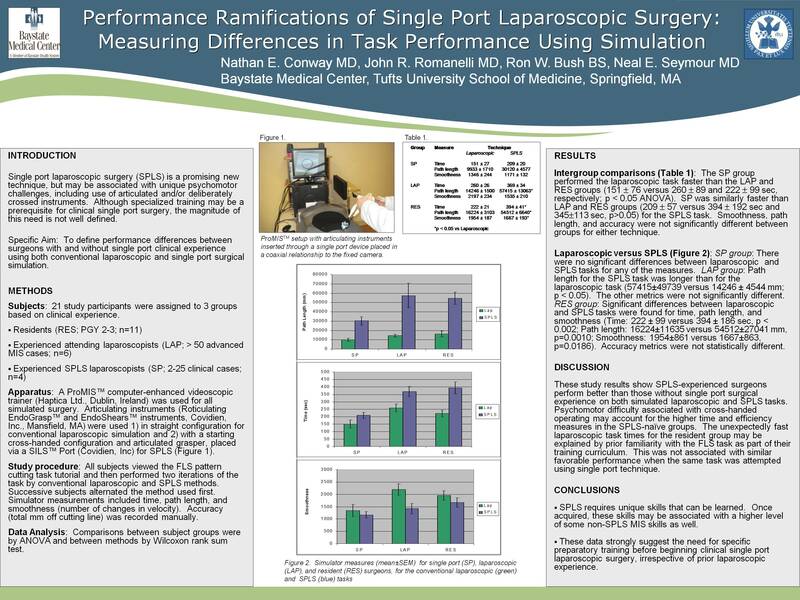 RESULTS: Task time was significantly faster for the SP group for both laparoscopic and single port methods (Laparoscopic: SP 151 ± 76, LAP 260 ± 89, RES 222 ± 99, p=0.0486. Single Port: SP 209 ± 57, LAP 345 ± 113, RES 394 ± 192, p=0.0238). Path length, smoothness, and accuracy were not significantly different between groups for either method. The LAP group path length was longer for the single port task than for the conventional laparoscopic task (57415 ± 49739 vs 14246 ± 4544; p=0.03). The RES group performance was slower (394 ± 186 vs 222 ± 99, p=0.0019) with longer path length (54512 ± 27041 vs 16224 ± 11635; p=0.0010) and with lower associated smoothness (1954 ± 861 vs 1667 ± 863, p=0.0186) on the single port task than on the conventional laparoscopic task. There were no significant differences in accuracy for any of the groups. DISCUSSION: Single port laparoscopic surgery requires unique skills that can be learned. Our data show that expert laparoscopic surgeons with clinical single port surgery experience, attained through non-systematic training in animate labs or supervised clinical settings, perform a simulated single port surgical task better than expert laparoscopic surgeons without this experience. Furthermore, this performance is comparable to that achieved with conventional laparoscopic techniques. Residents with less clinical experience performed the conventional laparoscopic study task as well as the more expert groups because of prior specific training on this task as part of their curriculum. However, their performance declined dramatically when confronted with the challenges of the single port task. These results strongly suggest a role for systematic lab-based single port training prior to clinical application, as is now done for conventional laparoscopy.